The World of SETI project was completed at the end of April 2011 and it is actively on display in the "fishbowl" at the SETI Institute headquarters. 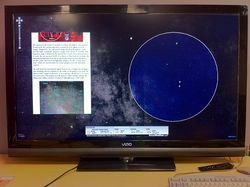 World of SETI is running in the Firefox web browser and is being displayed on two 55" Vizio HDTV LED LCD monitors. 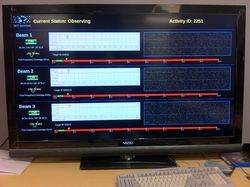 The first WoS screen shows the 3 beams' status, baseline display, and waterfall plot. The second WoS screen shows the Google Sky image where the ATA is pointing, the 3 beam positions, some informational text, and a Hat Creek weather report.